The Drawing Center, 35 Wooster Street (btwn Broome and Grand St) in SoHo, New York. (with Xia Gordon, Leslie Lasiter, and Kurt Woerpel) Please RSVP here. Three creatives discuss the dynamic world of do-it-yourself publishing! (with Sarah Lammer, John Mejias, and Matthew Thurber) Please RSVP here. 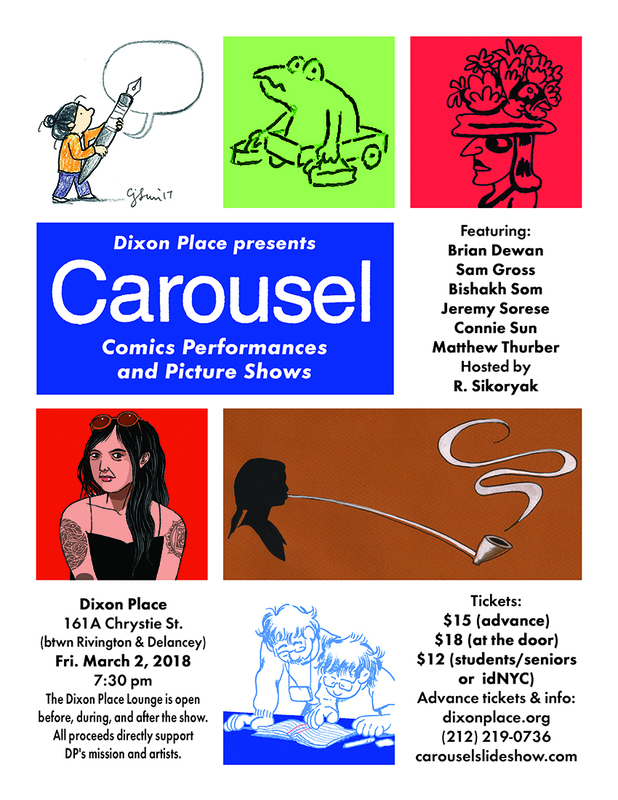 Step right up to a three-part variety show featuring performances by cartoonists Sarah Lammer, John Mejias, and Matthew Thurber! Police Sketch Game Please RSVP here. An interactive drawing game where the audience helps three exhibitors from the show identify the perpetrator of a crime. (with Steph Davidson, Walter Green, and Hannah K. Lee) Please RSVP here. 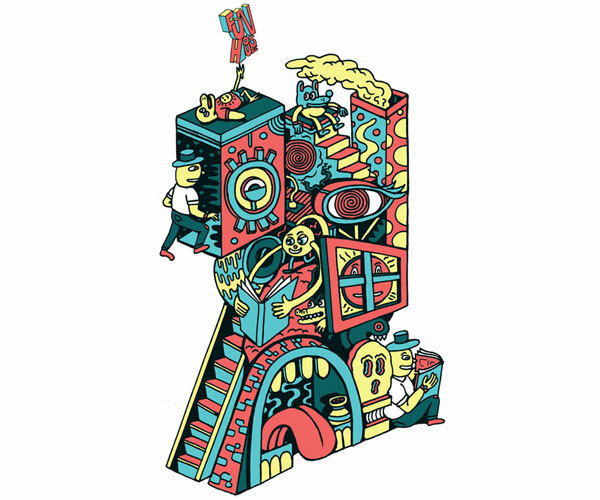 Three art directors discuss the ever-changing illustration industry. Eyeworks Animation Screening Please RSVP here. An animation screening organized by the Eyeworks Festival of Experimental Animation. kuš! comic zine workshops, lead by artist Oskars Pavlovskis from Riga, Latvia, will be a collaborative comic drawing experience suited for participants of any age and skill level. A selection of FUNHOUSE artists from L to R: Thu Tran, Rob Corradetti, JooHee Yoon, Monica Ramos, Jeff Ladouceur. Sarah Lammer, Oskars Pavlovskis, Whit Taylor, and R. Sikoryak. Go to our instagram feed @funhousebookfair to see work by all the FUNHOUSE artist. Desert Island is a unique illustrated book store in Brooklyn. The modestly sized shop is packed with art from top to bottom and the decor includes an enormous handmade chandelier, painted cartoon cut-outs, elaborate paisley wallpaper, sculptural remnants of former window displays, and piles of Smoke Signal, the free comics tabloid published by the store. 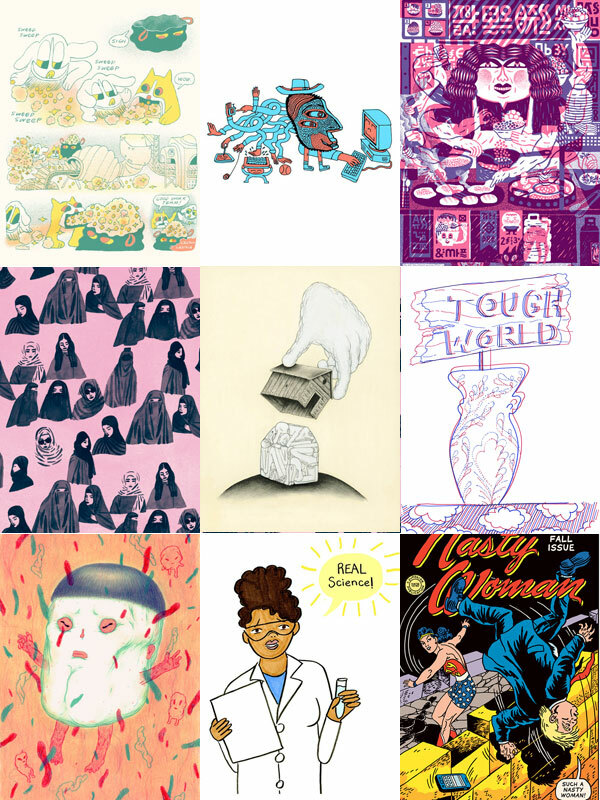 Any artist can sell comics or zines at Desert Island, making for a fun mix of unexpected creations from all over the world. Several Carousel artists will be featured at the Montclair Literary Festival on Saturday, March 17, 2018. Cartoonists from the New Yorker and several other publications share and illuminate work inspired by our current president. 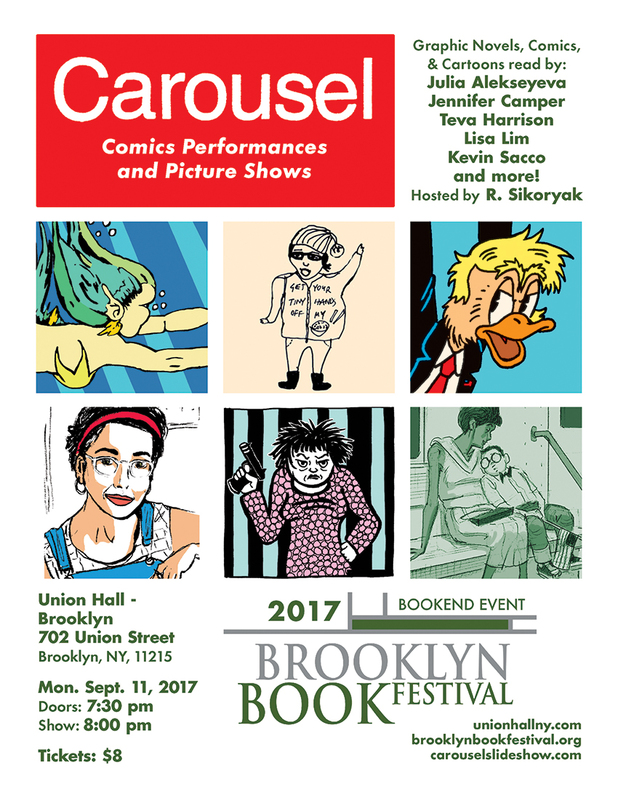 With R. Sikoryak, Emily Flake and Lauren Weinstein, moderated by local graphic artist Kevin Pyle. Brian Dewan is a visual artist and musician living in the town of Catskill, NY. The filmstrip What Will You Do With Your Freedom was first screened at the Tang Museum in Saratoga NY. He has also shown filmstrips at the Whitney Museum of American art, Modern Art Oxford and the Museum Of Jurassic Technology in Culver City, CA. Sam Gross has been drawing cartoons for a long time. They have appeared in such diverse publications as Good Housekeeping and The Realist. Mrs William Horsley is a research vehicle for investigations into abstract and literal puppetry. The energy contained within hematite refracts into animated film, performance, comics, etc. scattering shards of Delight. Sculpted out of a chunk of feminized hematite discovered in the Pacific Northwest in the 1950’s, it is currently parked in Catskill, NY and is owned and operated by Matthew Thurber. Cartoon slide shows drawn and narrated by an array of comic artists, graphic novelists, voice actors, and more. Featuring stories, gags, live drawings, and audience participation! For kids and cartoon-loving adults. Jef Czekaj is a cartoonist, children’s book author and illustrator, and musician who lives and works in Somerville, MA. He has written and/or illustrated 12 books with titles like Hip and Hop Don’t Stop!, Cat Secrets, A Call for a New Alphabet, and Austin, Lost in America. Deb Lucke is the author/illustrator of the Lunch Witch series which is being made into a movie starring Kate McKinnon. She also does comic journalism and fine art. Michael Rex is the writer and illustrator of over 40 books for kids, and the creator of Fangbone! which is now on Netflix. Please, no bright lights, don’t get him wet, and don’t feed him after midnight. 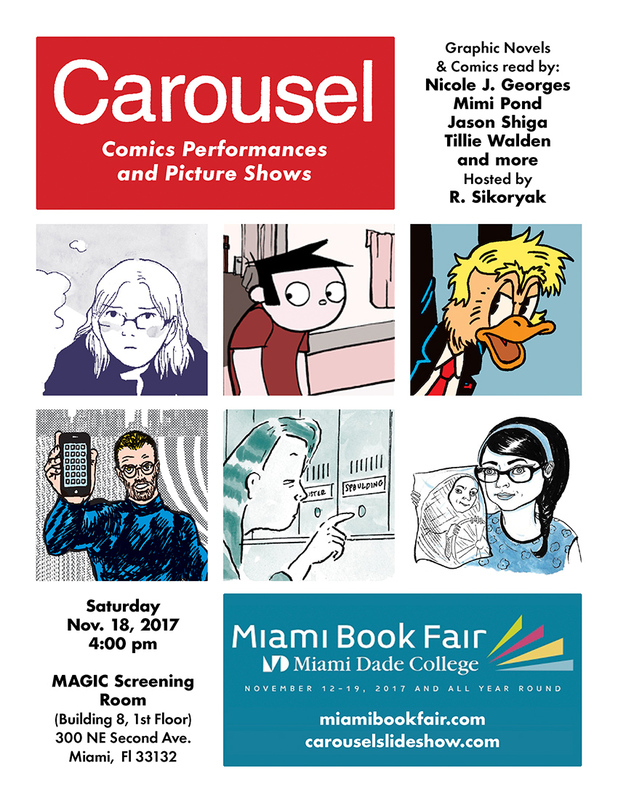 For the first time ever, cartoonist R. Sikoryak brings Carousel to Miami. 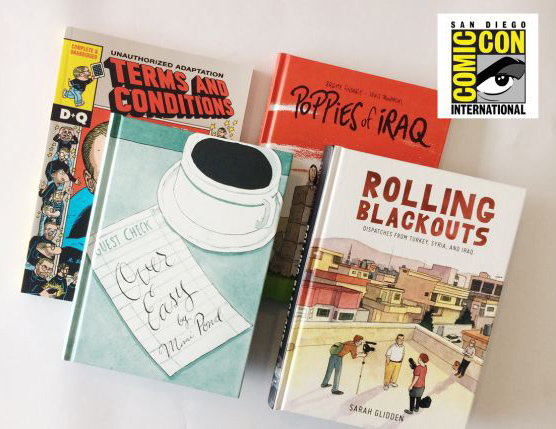 Join comics creators Nicole J. Georges, Mimi Pond, Jason Shiga, Tillie Walden, and R. S. as they present and read from their new graphic novels. The Los Angeles Times called it a “must-see panel of Comic-Con 2017”, and now it’s coming to Miami! 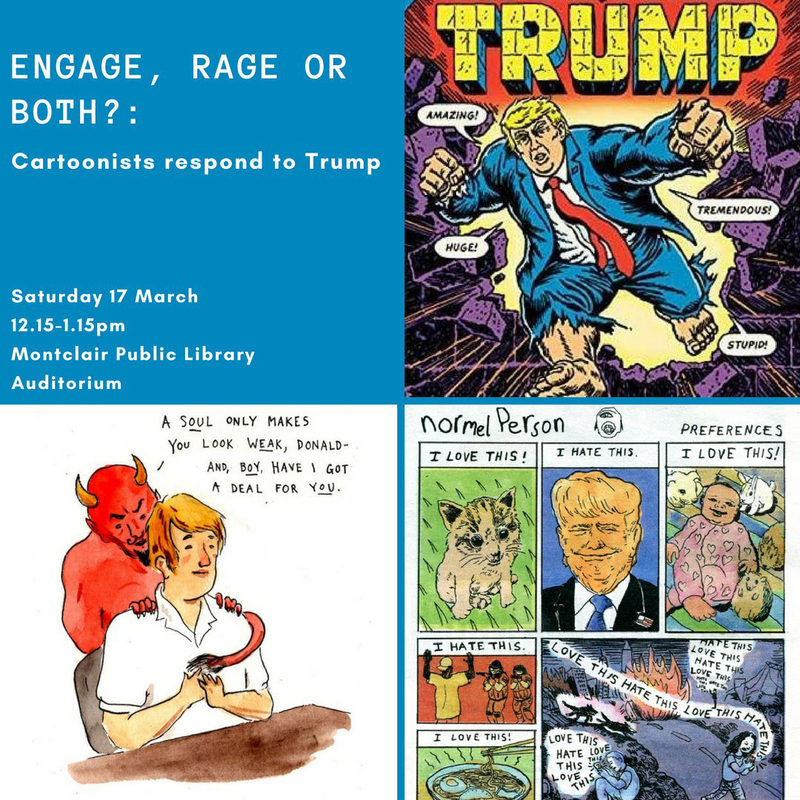 Political satire has reached new heights since the election of President Trump; Shannon Wheeler (Sh*t My President Says) and R. Sikoryak (The Unquotable Trump) promise laughter and tears (and a presentation with slides) as they work through the nation’s current political reality. 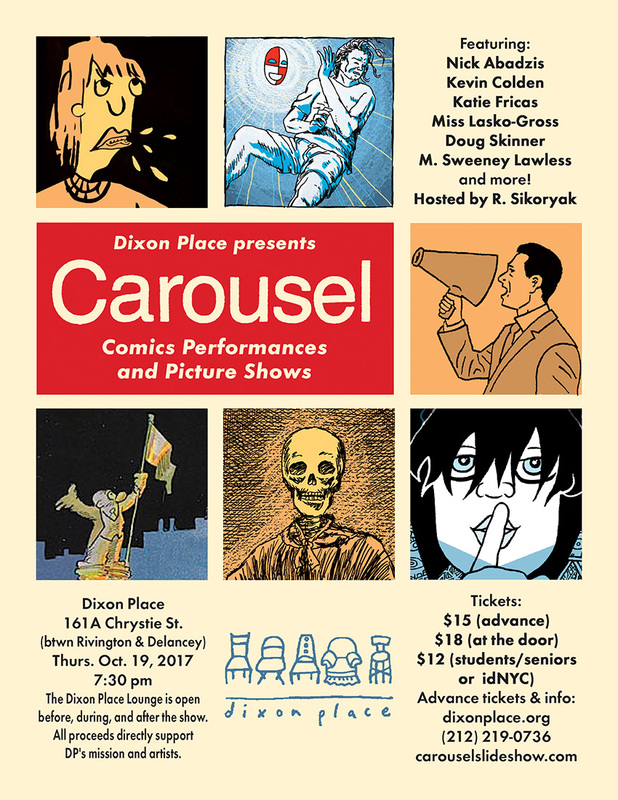 Live readings and projected presentations of graphic novels, gag cartoons, and other visual art. Plus live music and live drawing, too. Presentations of graphic novels and comics as read by the artists: Julia Alekseyeva (Soviet Daughter: A Graphic Revolution), Jennifer Camper (“Rude Girls and Dangerous Women,” “subGURLZ”) , Teva Harrison (In-Between Days), Lisa Lim (Mutha Magazine, Guernica Magazine), Kevin Sacco (The Plane Story, Josephine). R. Sikoryak will be at San Diego Comic-Con 2017, signing at the Drawn & Quarterly Booth (1629) and participating in seven panels from July 20-23. 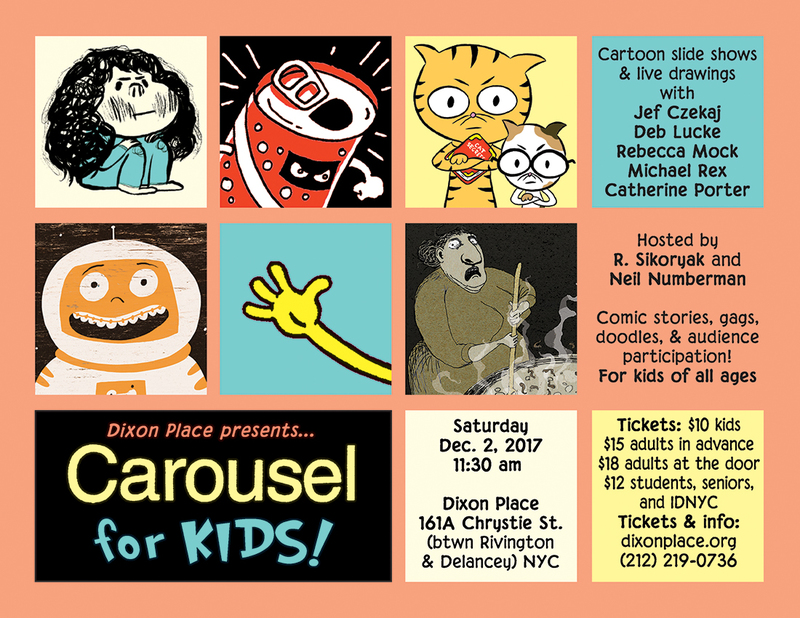 Creative director Nathan Kane and managing editors Terry Delegeane and Chris Duffy join forces for a tour de “farce” of the best humor comics in the business. Meet some of the Bongo and United Plankton writers and artists, including Jacob Chabot, R. Sikoryak, and more, who tickle your four-color funny bones and find out what’s in stores in the months to come! R. Sikoryak (Masterpiece Comics) is a master of the satirical graphic novel adaptation.Heidi Macdonald (The Beat, Publishers Weekly) leads a conversation with Sikoryak about his two most recent projects: Terms & Conditions, which is a 99-page, word-for-word adaptation of the iTunes terms and conditions agreement, and The Unquotable Trump, which sets Donald Trump quotes from the 2016 presidential election in classic comic book covers, employing hero and villain tropes to devastating effect. Celebrants and detractors alike are chewing on the fact that Donald Trump was elected president. Shannon Wheeler and Robert Sikoryak will help you swallow. 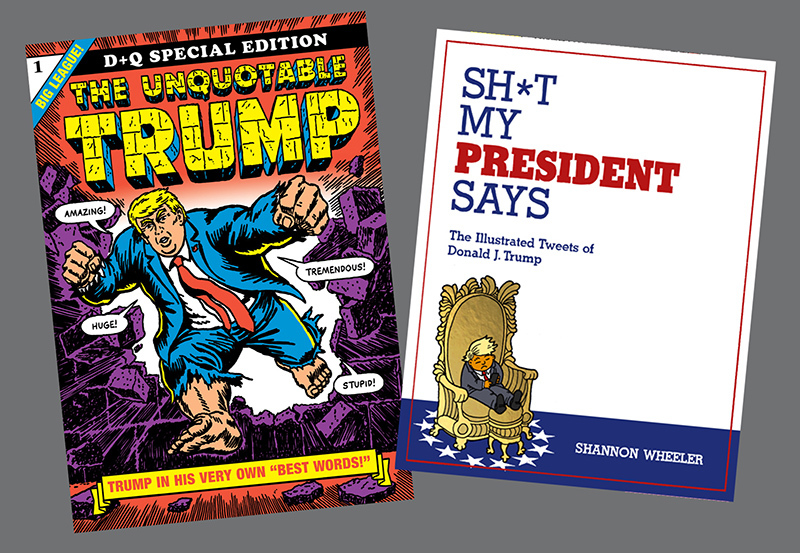 In their books Sh*t My President Says and The Unquotable Trump (respectively), these two cartoonists illustrate Trump’s words for comedic effect and insight. There will be slides, a brief history of political satire, and laughter through the tears as they wrestle with an understanding of our current dystopia. Can satire keep up with reality? Shannon Wheeler is the two-time Eisner winning creator of Too Much Coffee Man and a New Yorker cartoonist. Robert Sikoryak started at Raw magazine, is a New Yorkercontributor, and a Comic-Con special guest. How can the graphic novel format enhance prose texts? And how can educators use adaptations to make stories more accessible? If you read the graphic novel instead of the prose novel, does it still “count”? How does the story change if a classic is adapted into graphic novel format? Is something lost? Is something gained? And what if graphic novels are then converted into prose novels, as with the forthcoming Lumberjanes novels? Moderated by Kelly Quinn Chiu (children’s librarian at the Santa Clara City Library), this panel includes Mariko Tamaki (Lumberjanes), Brook Allen(Lumberjanes), Landis Blair (The Trial: A Choose Your Own Kafka Adventure), Charles Kochman (editorial director, Abrams ComicsArts), and R. Sikoryak (Masterpiece Comics). Ever since the dawn of Marvel’s “superheroes with real problems,” costumed adventurers have been letting their psychological damage show. Spider-Man’s guilt and insecurity, Batman’s tango with trauma, Captain America’s survivor’s guilt, Jessica Jones’s smorgasbord of symptoms, and Star-Lord’s daddy issues are just some of the mental challenges that modern superheroes deal with. Dr. Travis Langley(Batman and Psychology), R. Sikoryak (Masterpiece Comics), Dr. Janina Scarlet (Superhero Therapy), Alex Langley (The Geek Handbook), and moderator Danny Fingeroth (Superman on the Couch) hold a lively discussion of the psychological challenges that many heroes (and some villains, too) deal with. Abraham Riesman of Vulture discusses the breadth of humor and satire possible in the medium of comics. He’s joined by Mimi Pond, whose fictionalized memoir The Customer Is Always Wrong is rich with the slang and jokes of 1970s Bay Area counterculture; R. Sikoryak, whose satirical takes on the 2016 presidential election online and tech jargon in Terms and Conditions have delighted readers everywhere; Gemma Correll, whose relatable comics about anxiety and pets appear on The Guardian and are collected in The Worrier’s Guide to Life ; and Simon Hanselmann,whose meticulously watercolored stoner witch comics (published on his tumblr and in books such as Megahex and One More Year) are soaked in a black humor. This year, Drawn & Quarterly‘s guests are Mimi Pond who will be debuting The Customer is Always Wrong, French cartooning duo Brigitte Findakly & Lewis Trondheim who will be debuting Poppies of Iraq, R. Sikoryak, with the debut of The Unquotable Trump, and Sarah Glidden, with her latest book Rolling Blackouts: Dispatches from Turkey, Syria, and Iraq. They’ll also have debuts of Tom Gauld’s Baking with Kafka plus early copies of Seth’s Palookaville 23. 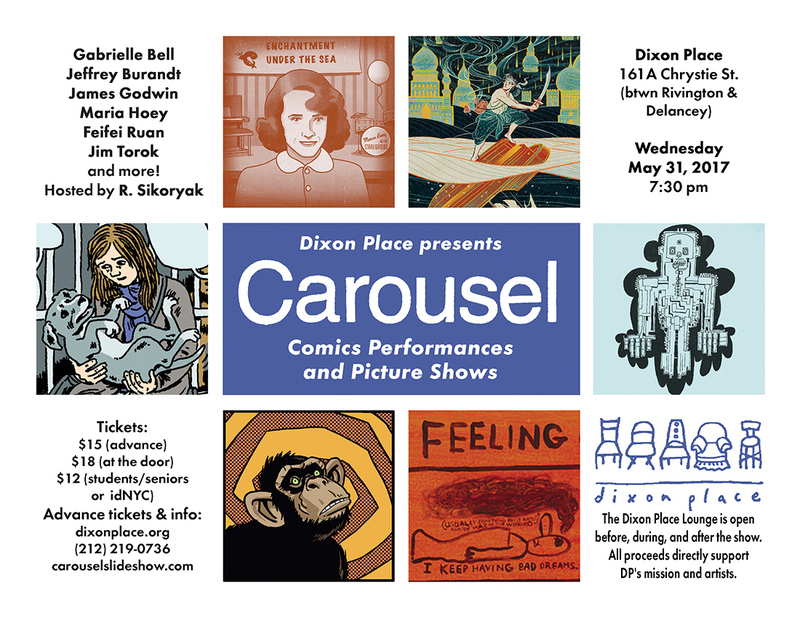 Presentations of graphic novels and gag cartoons, plus live drawing & more. Gabrielle Bell is the author of several books, including Everything is Flammable, Which is out now. She lives in Brooklyn, New York. Frontman for the sci-fi rock band Americans UK, Jeffrey Burandt is also the writer of the Maverick Book List Award-winning graphic novel Odd Schnozz & the Odd Squad from Oni Press. His most recent work has appeared in the New York Times Best Selling Love Is Love anthology. James Godwin is an artist, performer and puppeteer who has worked in film, television and theater. He is a founding member of “Uncle Jimmy’s Dirty Basement” and “The Elementals” and has worked with David Bowie, Dave Chappell and Wyatt Cenak, his recent show “The Flatiron Hex” will be remounted this September at Here theater. Feifei Ruan is a Chinese illustrator and comic artist based in New York City. Her clients include Penguin Random House, BOOM!Studios, The JimHenson Company, Archaia Entertainment, Cartoon Network, BuzzFeed and Nautilus. 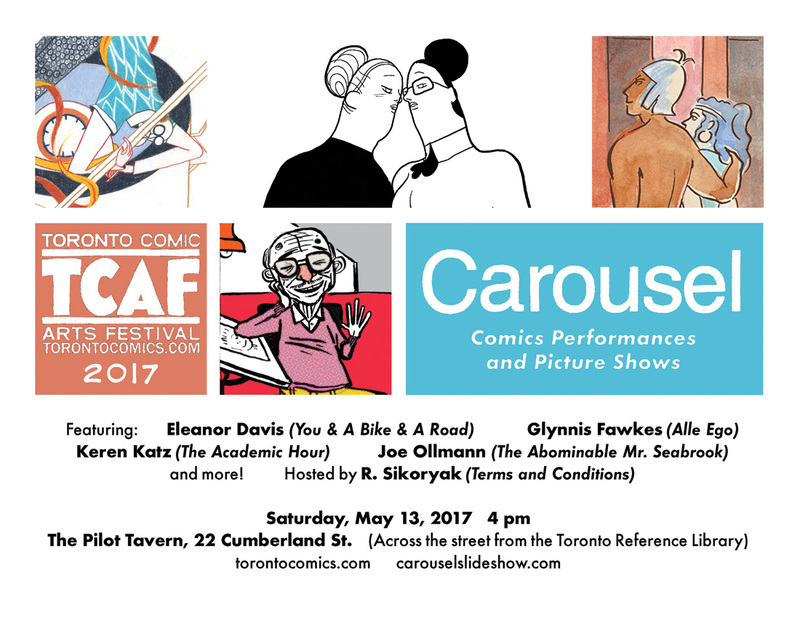 Carousel, R. Sikoryak’s long running comics performance/reading series, returns to TCAF with shows and readings from a slew of the top talent at the festival this year. Featuring Eleanor Davis, Glynnis Fawkes, Keren Katz, Joe Ollmann, and more!